African governments are failing to make proper use of local Red Cross and Red Crescent societies, despite their capacity to provide much-needed broad humanitarian support, including funding and local volunteers, the agencies concluded at a conference this week. The International Federation of Red Cross and Red Crescent Societies (IFRC) want to intensify cooperation to benefit vulnerable communities. The Johannesburg Commitment, the product of a three-day conference in South Africa, "seeks to ensure that communities are in the forefront of designing and delivering effective solutions to the increasing number of humanitarian challenges facing African people", a statement said. The international federation is the world's largest humanitarian organisation. According to Mukesh Kapila, special representative of the secretary general of the international federation, it now has even more to offer governments. 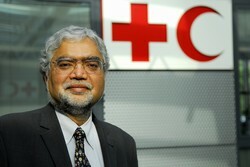 "Over the past four years the Red Cross has mobilised 70,000 volunteers who can be availed of, which you think governments would be keen to do, as they claim they lack people to roll out their programmes," Kapila told IRIN on Wednesday. "We are about connecting governments and their delivery systems, like hospitals, with the donor bodies. While donors have billions of dollars in aid, they need to be connected with government systems in a meaningful way for that money to benefit people on the ground." Along with HIV/AIDS, climate change also featured prominently at the conference, given the growing body of evidence indicating that natural disasters are becoming more frequent and extreme due to global warming. The international federation agreed to revamp its disaster management arrangements so it would be better prepared in future. "We are going to upgrade our early warning systems in these areas and also invest much more in capacity building on the ground, so that the little disasters you never hear about are dealt with," said Kapila. "We need to invest in climate change adaptation in poor communities so that they are better prepared to withstand the rigours of a natural disaster. This would include improving the resilience of infrastructure and ensuring development programmes don't compound a climatic problem." Conflict and violence in urban settings was also high on the conference agenda, especially considering South Africa's recent experiences with xenophobic attacks on foreign nationals, which killed 65 people. "The Red Cross has decided it needs to concentrate on how to build a culture of peace in affected communities, which could be done through implementing school talks and other forms of education," Kapila commented.